Sunset - Apple Tree £12.75 - Dessert Apples - Mid Season Apple Trees and Fruit Trees For Sale. Buy at competitive prices with wholesale discounts. 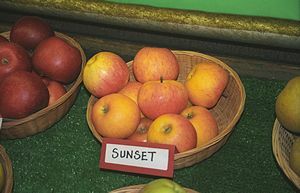 ‘Sunset’ is one of our best selling eating apples. It tastes very similar to a 'Cox’s Orange Pippin', sweet, sharp, crisp and aromatic. The apples ripen to a striped red, orange-yellow flush – somewhat like a sunset! The fruit is very disease resistant, producing reliable crops of blemish-free apples. It’s an excellent ‘Cox’ alternative as it proves much easier to grow, especially in the wetter parts of the country. Fruits are ready to pick and eat through September/early October.